I played 19 games a first time and there really was some awesomeness in it! I sincerely recommend the following. Machi Koro is a true Japanese marble. A great looking, fun and fast filler. Simply fun! Say Bye to the Villains by Seiji Kanai is great cooperative challenge. It is tough. It is fun to convene and to figure out what to do. Roads & Boats is big in many ways. There is so much wrong you can do to yourself and to other players in this brutal Splotter. Freedom: The Underground Railroad is a great historical game. It is cooperative and it is tough to deal with limited resources and those nasty guards. Sail to India is a lot of game in a small box. It is cube pushing pure sang but in a way I love it. Depending on the location, a cube can be anything, cash, points, goods or something else. Koryŏ is a really nice card game. It is fast paced and a lot can be done. Alarm! is a nice filler with a lot of take that, it guarantees hilarity. I love the artwork of this Japanese marble. The game play is so lovely easy. A player rolls a die and then look up your cards if one of them generates you income. Some cards generate income at any person's turn, some at your turn only or a few even only when somebody else rolls. Income is in coins and at your turn you may purchase a building. You can pick any building from the middle of the table or you may build one of the four own unfinished buildings where you started with. The first player to complete there four buildings wins Machi Koro! Great lovely artwork, nice, easy and engaging game play. Awesome! This is a cooperative game that is really challenging as it is far from easy to win from all the villains, and that is exactly the requirement for winning the game. In the game you are all heroes and you are preparing for a one on one fight, each with one villain. Only time and attributes are limited. So you have to help other players and communicate about the needs and possibilities. This is a nice game with great artwork at the cards. The convening that comes with this game is great. This is another awesome game by Splotter. There is a lot going on, there are many ways to do something wrong to yourself or to your opponents. I like this kind of brutalness in games. The nastiness in this game is in the way you can claim or loose possesion of goods. Every turn some fields produce goods which is left for pick up. If you are first there to claim it is yours and conflicts are decided by turn order. You can only have as many goods as you can transport. So you must build vehicles and roads to get them to claim resources. This is a game you can play, win or loose in may ways. I like the components. The mines, which can go deplete, are also very cool. They are presented by numbered pillars and their outcome is decided by drawing a chit out of a bag with the same number. Great game! Hopefully we can play it quicker next time! A cooperative game where the players try to move slaves from the Southern states to Canada. The game looks really great and I really like how the slave catcher are patrolling the roads. They are really a head ache when you want to manouvre many slaves towards the North. Resources are scarse. The game really forces players to convene. This is a great tough game. I am looking forward to a next challenge! Magnificent that somebody put so much game in such a small box. The game consists of a couple of cards and a few cubes only. The cubes can be goods, ships, technology, victory points, money or a building. It depends on the position. The rules are pretty straightforward and the game plays fast. I really enjoyed this game. A shame that the green and blue cubes are too similar in color. I will mark some cubes with black dots, I think. Nice experience with so few components. A game with nice card artwork. There are action cards and cards numbered 1 to 9. The number also says how many cards of these are in the game. Each round you get dealt a number of cards. In the early rounds you get dealt more cards than in later rounds. At your turn you play from your hand one type of card in any quantity you possibly can. If at that moment you have the mayority in any type of card you may perform their special ability. A shame that you possibly have to discard a number of cards and the end of the round. The number you have to discard to gets a little bit higher every round. The action cards have a value of -1 and these cards you cannot discard normally. At the end you get points as printed on the cards only if you have the mayority. The game plays great. It is fast. The symbols used on the cards are not too clear but after a few rounds you know. This is a neat little card game. It has player elimination and this is fine because game play is fast. The player at turn, reveals as many cards as there are players, one at a time, and then decides who to give a card. Most cards are bad and if you collect a certain amount of them, you are out of the round. Once per game you can bail out and discard one card from your display, but you then still are in trouble. Some cards are good and can erase a bad card. I really like the artwork in the game and the finals, if only two players are left, is also done very clever. You have to discard a money card to play and if you cannot, you are out as well! Great graffiti like artwork! Recommended. I love the piggybacking in this game. Per period you pick five cards from 15 and per round each player chooses a card. First player announces his first role card and if you have that card in your hand, you can do an action too. Additionally there are two factories represented by the wheels and if there is one of each raw material in a factory, a good will be manufactured automatically. These two are nice mechanics and the game flows fast. The down time is in studying the buildings that can be built. I think there are way too many. This is a fairly simple, nice and fun racing game. The components of the game are great. The game board is really impressive and the houses and trees really look nice. Each player has a sled pulled by two dogs which are printed on two cards. You manage your sled with huskies by placing one card or two cards with the same value. The sled goes forward as many spaces as the total value of the two cards and your sled goes left or right as many spaces the difference in the values of the two cards. And that is how you try to avoid objects and to steer your vehicle towards the finish. This is another clever game by Reiner Knizia. You try to increase the value of the cards and only if other player follow to join ship you might succeed. So this is a game where you have to spot opportunities. As I was an avid Donald Duck reader in my youth, I really enjoyed the artwork. When I first saw the game I lost interest because there is no map of Russia in this game. In essence this is a worker placement where you try to develop three railway lines or your industries. You move your building blocks up to the destination. There are so many ways to collect points that it nearly feals meaningless what you do. Interaction is minimal because there are enough choices who look similar. This is a great looking game with some serious deck and resource management. This makes playing the game very calculating because in this race game you really want to count every step. Progress in the mountains requires different resources than going forward at a river. And this carefull planning can be big fun. A player's turn can be very fast or it can be very slow. The high number of cards, all with unique characters add atmosphere to the game. Unfortunately a bit too many of these cards come with unclear iconography. Having played the game now twice, once with four and with five. I think the game plays greater with fewer numbers as there can be too much downtime as in between your turns there is hardly anything going on what may influence you. 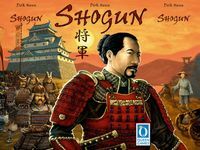 Shogun is a nice game where battles are fought using the mysterious cube tower. The game lasts two years and each year has three rounds only. The planning occurs on your own board and this is where you instruct your provinces to either harvest, tax, reenforce or attack other provinces. Planning is a bit of a hassle and this reminded me a bit to Colonial: Europe's Empires Overseas with a big difference that I like Colonial a lot more. For my feeling this game plays a lot slower. The nicest is the surprises that the tower may reveal. Ultimate Werewolf is fun, even if there is the possibility that you are eliminated in the first round. The table talk trying to find out the identity of other players is really great. Given that this game requires a high amount of players and a moderator I fear that this game only serves at rare ocasions. Nice simple rules. Somebody is a wolf and the other persons are piglet, mother pig or little red hood. Each player chooses to go sleeping or stay awake creating a trap for the wolf. The wolf then chooses who he tries eating. I am terrible in this kind of games, still I enjoyed it a lot! The game has lovely art and nice compenents. It is a pity that we had to consult the rulebook a few times too many during game play. In essence the game is pretty simple. Assign a guest by using maximum three cards. This way deduction is used to assign the guest a seat. Unfortunately this comes with a lot of bookkeeping. Nice components and I like the idea of having coffee with Gustav Mahler! 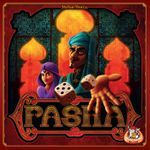 In Pasha there are five dice and at your turn you may throw three times. That sounds a lot like Yahtzee. But it is a lot more interesting that Yahtzee as in Pasha you can adjust a dice roll by one pimp by spending one of your scarse cubes and that per round there is a target added. With few persons there is too less going on. With more persons there is some downtime. The game has great components and nice artwork! At your turn you may cut the cake in pieces, then all other players choose a piece and you are left with the last piece. When you obtain cake you have to decide to keep it or to eat it. If you keep it, it only scores you points if you have most of these kind. If you decide to eat it, it scores you points for sure but of course a tad lower than possibly. Fun and fast game what is nicely simple. Place a card close to the target card and if you win you get some points. If you did not win the card and you played out of the zone, set by two cards left and right from the target, you end up with a penalty. I see there is some fun in it as it is fast, simple and can have a bit of all or nothing. This is not my cup of tea.